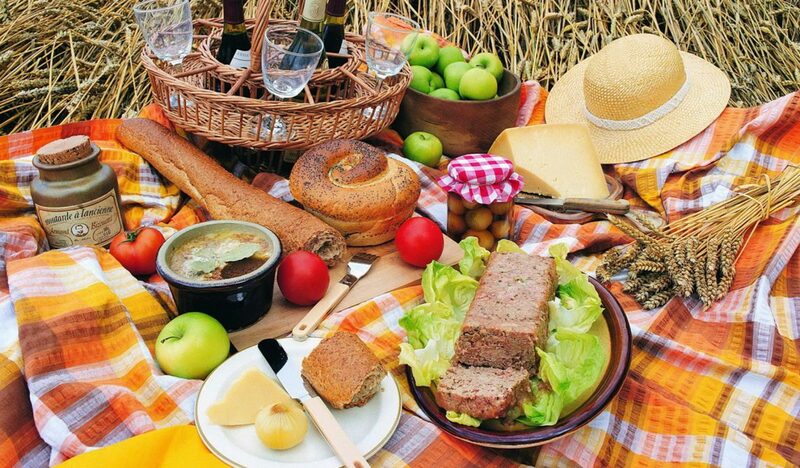 There’s nothing quite like a picnic on a warm summer day, but what makes a great one? Food and drink that have been paired to perfection. Most people focus on just providing the food for a picnic, but with some canny pairings with thirst-quenching drinks, you can elevate your picnic to the extraordinary. Originally from San Francisco, blackened chicken is super easy to make and a firm favourite with us Brits. All you need are chicken breast which you cover in black pepper, allspice and paprika then flatten and cook in a frying pan for 3 – 4 minutes until cooked. Homemade ginger beer is much nicer than shop bought and a cinch to prepare. Take fresh ginger and grate it into a bowl alongside muscovado sugar and the juice of 3 lemons. Add fizzy water or soda and adjust the sweetness as required. A lovely twist on salmon fillet is to add Thai spices and serve with a green salad. Fish is really easy to cook so don’t worry, all you do is wrap the fillets up after you have seasoned them with Thai spices and cook in a fairly moderate oven for around 20 minutes. When they just start to flake you know they are done. Team with a crisp dry chardonnay to accentuate those spices. Pork and apple are an amazing flavour combination, by using pulled pork you are putting a modern twist on this famous pairing. Cook the pork in a slow oven for around 3 hours and leave to cool before packing up, ready to pop into fresh white crusty bread rolls or bread. A dry cider will cut through the sweetness of the pork. If you really want to impress your guests, take along a mini barbeque and fry up fat steaks with seasoning. Serve rare with a potato salad and bread to soak up all those delicious juices. Pair with a robust red wine such as a sauvignon or a merlot. This is a simple but effective dish and you can use the leftovers for a meal the next day. Soak the hocks overnight to remove any salt, then rub jerk seasoning over them before popping into a slow oven for around 3 – 4 hours until the meat falls off the bone. Put into a plastic container with a little olive oil and lemon juice and it will keep for at least a week. Make a BLT by adding lettuce and tomato with the jerky ham. Serve with an iced elderflower cordial. If you have anyone who is a vegetarian coming to the picnic you don’t want to leave them out, so surprise them with these tasty veggie burgers. They are as easy as their meat versions, all you do is blitz chickpeas with garlic, herbs and spices in a blender, mould into patties and fry. Use wholemeal or brioche buns alongside melted cheese and salad. Team with a refreshing jug of iced tea. It is easy to create great picnic memories by teaming up super food and drink combinations. Being prepared and planning your menu in advance allows everyone to enjoy an amazing picnic.